If you plan to make rosaries for gifts or to eventually sell, you will want to choose the finest parts that fit your budget. These may range from 14k Gold parts, to Sterling Silver, or to some very finely crafted Base Metal Parts. This guide to all the various metals, listed from the most expensive to the least, will help you make your choice based on the desired look, durability and price. Technically, gold-plated describes jewelry - in this case Crucifixes and Centers-with a layer of at least 10K gold bonded to a base metal. The plating can be a more expensive 14K or more and that usually determines the price of the piece. Even the best gold plating eventually wears away. How long the piece will last depends on how often the rosary is used and how thick the plating is. The word "karat" is used to indicate the percentage of pure gold in an article of jewelry. Gold in its' pure state is considered too soft for ordinary jewelry applications --it is generally alloyed with other base metals chiefly copper (but also nickel, silver and zinc). Pure gold is 24 karat; other alloys are simply a percentage of 24 karat. The 14K gold, standard for fine jewelry in the USA, is 14/24 parts pure gold. The rest is alloy. It is hard, durable and beautiful. Sterling silver is made of 92.5% pure silver and the rest copper or other alloy. Sterling will tarnish over time but is easily cleaned with jewelry cleaner. 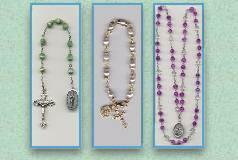 Silver rosaries will resist tarnish if they are handled regularly. Silver-plated items are sterling over brass. They look just like pure sterling. Pewter consists of at least 900 parts per 1000 Grade A Tin, with the remainder composed of metals appropriate for use in pewter, such as antimony and copper. Most pewter pieces are hand crafted and may vary slightly in shape, size, finish or capacity from one piece to the next. The color is slightly darker and heavier than sterling silver, and is a very durable metal. Nickel silver is an alloy of nickel, copper and zinc. It is strong, resists tarnishing, and yields surprisingly good (and inexpensive) results for detailed centers and crucifixes. Oxidized metal is also a strong, inexpensive alloy that has been antiqued (blackened). 14 karat (14k) gold is 14 parts gold to 10 parts other metal. 10 karat (10K) gold is 10 parts gold to 14 parts other metals. Alloy A metal made up of a mixture of two or more different metals. Common examples of alloys include bronze (a mixture of copper and tin), brass (copper and zinc), and pewter (tin with antimony, copper and sometimes lead). Base Metal Non-precious metals used as a core for plating and gold-filled items. Brass and nickel are common base metals in jewelry. This is a collective term for any and all non-precious metals. Carat Unit of weight for gemstones with 100 points to a carat, with one carat equaling one-fifth of a gram. as opposed to small veins or nuggets that must be mined out of other rocks. It is also found in various ores such as chalcopyrite, chalcocite, cuprite, and malachite. When alloyed with tin it forms bronze, and when alloyed with zinc it forms brass. Electroplating The process of covering a base metal with a thin film of gold. The base metal is set in a chemical solution, and an electric current flows through to coat it with precious metal. gold leaf or gold foil. Gold A yellow precious metal which is valued for its beauty and purity since it does not oxidize or tarnish like most other metals. It has been used for coins and jewelry for over 6000 years and from this has become regarded as a symbol of wealth. Gold is very ductile and is the most malleable of all metals. It can be cast into huge statues or beaten into wafer thin sheets of gold leaf. This malleability makes it too soft to be used in jewelry without being alloyed with other metals. Gold Filled The jewelry is not actually filled, but is made of base metal (usually brass or copper) covered by sheets of gold in a mechanical bonding process. Gold Plate A thin coating of electroplated or mechanically plated gold on top of a base metal. Gold Tone Jewelry done in a gold color. Gold colored or electroplated, not gold as is measurable in karats. High Polish A surface which is polished to a mirror-like finish. Oxidation (Antiqued) Darkening or other color changes of metal which is accelerated by humidity, especially salty air or the presence of acidic perspiration. This does not happen to very high-karat gold or stainless steel. and a bit of silver or copper. Rhodium A noble metal with a whitish gray appearance. Silver One of the three "precious metals" along with gold and platinum which has been used to make jewelry for thousands of years. Silver has a lustrous white color but needs polishing occasionally because silver reacts with sulfur in the air to cause tarnishing. It is harder than gold and much more plentiful, but still too soft in its natural state to be of much use as jewelry without being alloyed with a harder metal. Silver Plated A very thin layer of silver bonded through an electrical process to a base metal core. Stainless Steel Steel containing chromium and is resistant to rust and corrosion. with 7.5 parts of another metal, usually copper, to make the piece harder. Surgical Steel Stainless steela non-allergenic material when not plated. It is darker and grayer than sterling silver. Vermeil A heavy gold electroplate over sterling silver. What about Size of Crucifix and Center relative to bead size? We did a little math and came up with a formula that might help if you think your Crucifix looks too small, or the center piece too large. We looked at a number of rosaries offered for sale at various sites and compared the size of the findings to the size of the bead. The most appealing, in our opinion, were the ones that had a certain proportion about them. We found in almost all the rosaries we liked the best that the Center was at least twice the size of bead and the Crucifix a little over twice the size of the center. This is certainly no hard and fast rule. We tend to use smaller crucifixes for rosaries we know are intended for children. The most common size we use for 8mm beads is at least 2 inches. Another factor beside size is weight. 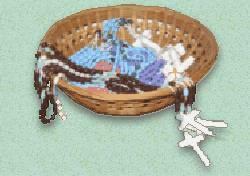 You don't want your Crucifix to be so heavy for the weight of the beads if you are using a lightweight bead, such as wood. All said and done, you are the artisan, and you should use any size you find appealing.